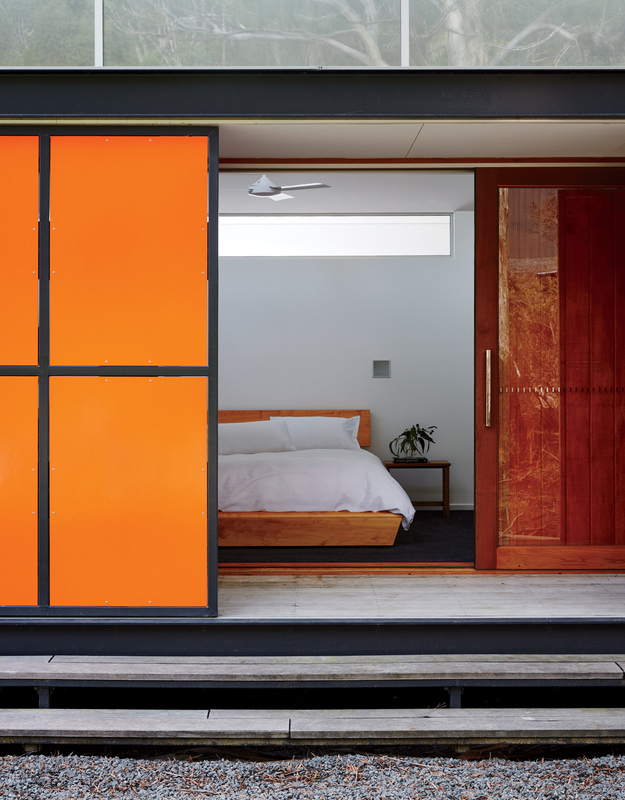 When you think of beach houses, this simple box, clad in vivid orange and red metal panels, probably isn’t what springs to mind. But then, the Tasman Peninsula, a remote region of Tasmania, itself a remote island that dangles 150 miles south of Australia, isn’t typical of the country’s beaches, either. 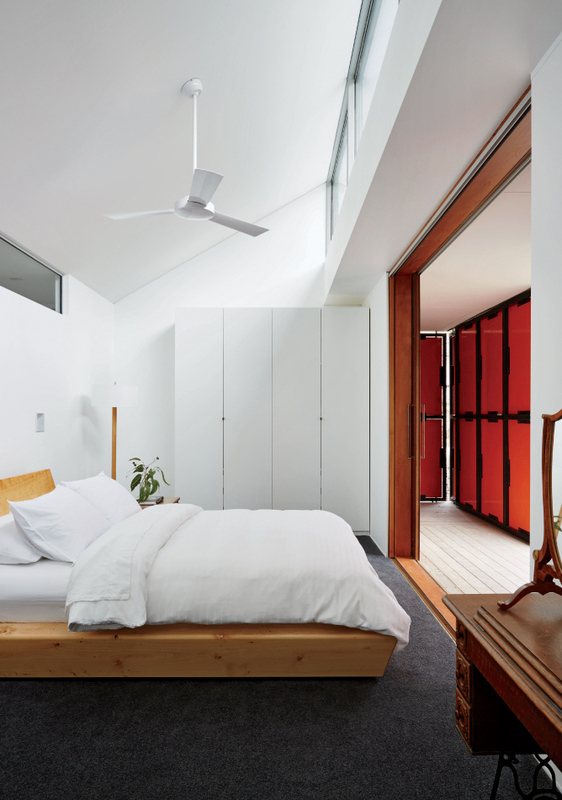 David Burns and Tania Soghomonian, the house’s owners, had previously worked with architect Misho Vasiljevich of Misho+Associates on their house in Sydney. The partnership is a natural fit: The couple both work in the field of environmental science and sustainability, and the architect specializes in energy conservation. In 2005, Vasiljevich relocated his practice to Hobart, Tasmania’s capital, to escape the urban intensity of Sydney. His clients, however, never even saw the island until five years ago, when Burns came to visit and was astounded by the sheer abundance of its untamed landscape. He was also drawn to the cultural dynamism of Hobart, which has in recent years become a stop on the international arts circuit, by virtue of the cutting-edge programming at the new Museum of Old and New Art. The two building skins form a veranda in-between, where Burns and his partner, Tania Soghomonian, often entertain guests. Large swathes of the island are devoted to national parks and UNESCO World Heritage sites, namely its wilderness and remnants of its penal colony past. The eastern side, where Burns immediately started researching available property upon his return to Sydney, is more populated but no less stunning. The couple eventually purchased a 47-acre plot with wide-angle views of the water, backed by a mountainous, double-peaked hill covered in dense stands of eucalyptus trees. Placed beneath this rocky escarpment, the new house is sheltered from southerly winds that blast in from the Southern Ocean. However, it faces north—in the direction of the sun—which leaves it open to occasionally blustery, cold, and salty northeasterly winds that reach up to 60 miles an hour. To counter this, Vasiljevich designed the modest 818-square-foot house as a “box within a box.” Inside the heavy-duty, weather-resistant steel frame and an outer skin of vividly colored, galvanized metal screens, there’s a “soft center” of two separate internal plywood cubes, one containing an open-plan living space, the other two bedrooms, each with a private en suite. 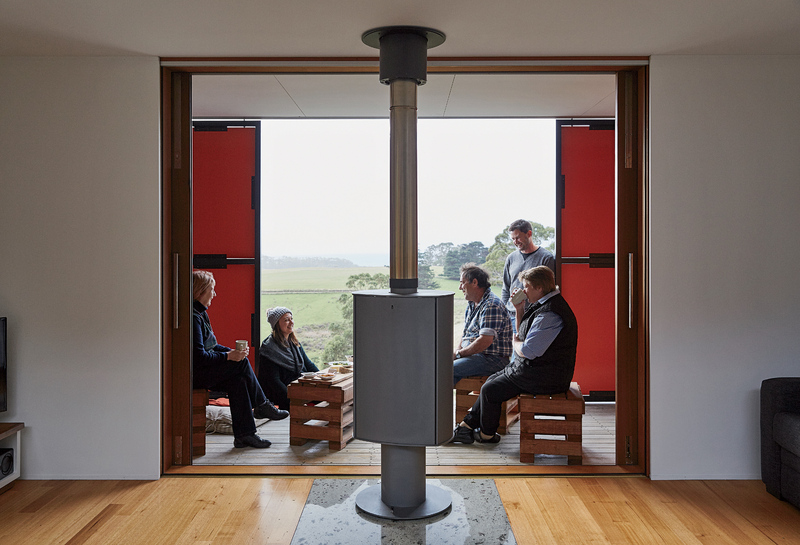 The home’s double-skin structure makes the most of Tasmania’s variable climate. This simple yet elegant layeredsystem gives the owners complete flexibility. The veranda between the inner and outer skins can be completely shuttered or left open as the weather dictates, and areas of the house can be closed off for privacy. Together with the wide eaves and passive solar gain through the double-glazed windows, this double skin means that the house has an extremely high > insulation rating (R8). And even when the shutters are closed, the broad clerestory windows along the long axis of the roof bring light to the interior spaces. A wardrobe from IKEA and a bed by Rye Dunsmuir outfit one of two bedrooms. While the home is connected to the electricity grid, it’s also self-sustaining, using an evacuated solar-tube system to minimize the energy it consumes to heat water, which works efficiently even in wintry, low-sun conditions. Rain-water is harvested from the roof and stored in three 10,000-liter tanks. An on-site Envirocycle system treats both grey and black water produced by the occupants and channels it to an irrigation patch of phosphate-absorbing native plants. The architect used plantation-grown timber for the inner structure and zinc—a recyclable, maintenance-free material that ages well—for the roof. Zinc is also highly resistant to fire, a persistent threat in Tasmania, despite its cool, temperate climate; the island’s high-velocity winds combined with the oil in the eucalyptus trees can create raging bushfires to equal any on the mainland. “The house has been designed so you can basically shut it down and walk away,” says Vasiljevich. What remains—exposed to Tasmania’s elemental, ever-shifting climatic moods—is a nearly featureless, armored structure, with a vivid color that appears to leap out of the landscape. The dark-red panels mark the entry points and slide open, like the screens in a Japanese teahouse.